It’s like there was never a problem at Meadowlands, as the season’s series roll through the programs and cut through the freezing New Jersey winds. Not all of the legs of the features on this menu are on weekend days but some of the biggest ensue, with the Presidential, an earmark of the early season schedule, starting this Saturday. Nothing frozen stops the Canadian movement of trotters and pacers and this weekend is no exception with the Willowdale and Lifetime Dream series in full bloom. At Cal-Expo, for all the doom looming over yet another threat to close, we engage in another no-takeout Pick 4. It’s Presidential season all around in the U.S. and while Republican stalwarts battle across state lines in primary wars, the monstrous older pacers cross swords in the land that Chris Christie forgot. Two splits, each worth $40,000, introduce the older set of pacers to the new season. In split one some familiar faces put their noses on the gate, the most prevalent being Blatantly Good. He had a marvelous season here two years ago and settled into mediocrity after that. We imagine that he will get a fair share of action due to liking the track and having Tim Tetrick aboard. But we like Annieswesterncard, a hard fighter who showed us at three that he liked the Big M. His older campaign has been productive and this year he could surface as a major player in the division. River Shark, in split two, adores this oval and won last week for fun. He is a speedball and already a veteran pacer among veteran pacers. To beat him, one of these guys has to show more talent than we know about at his new age. That could be Western Shore, who has done well in the older ranks and may have grown another level this season. Two divisions for five-year-old-and-under pacers with conditions make up the Complex Series contributions to the Jan. 14 card, these being worth only $18,000 each. Ron Burke’s Risk Management could be the horse of the month if he fires as she did last season. He is one of only four in this field to have gotten a pari-mutuel start already, which can be considered a tune-up. In the second division we have to take another look at Lizard King. He enjoyed this track last season and was a professional check-casher, though he did not win a lot of races. He is in this second tier of elders and may be a little better than the rest after his hiatus. 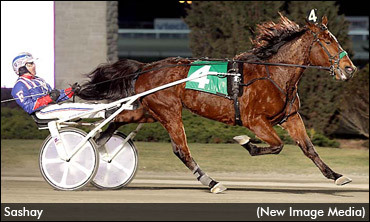 Saturday, Jan. 7, Woodbine offers another look at some recently turned four-year-olds in the second leg of the Willowdale Series for pacers and four- and five-year-old mare trotters in the second leg of the Lifetime Dream Series. We still like Audreys Dream, although he may not get us the kind of value we want in a win bet. But Mystician, who won a first-leg split, could be overlooked a bit and go off at high-percentage value. Older mares, especially the lonely trotting division, don’t get a lot of attention during the year, so how can we assess the newly aged gals in either of two $35,000 divisions of the second leg of the Lifetime Dream Series? Carefully is how we do it while looking for a sign of life that can surprise under the right conditions. Sashay (pictured left) comes into this leg on a three-race winning streak and will gather a lot of support at the windows. But on the outside, Miss Dangles may be able to upset, since she had a tough trip last week. The crowd may be unforgiving. The nightcap is wide open but we give it to the Zeron trained-and-driven Lively, predicting a sweep for the Z-man in the bike. We have to start this out with last week’s 44-1 Cladstownimpression (4). After a speed duel early while leaving from post 8, this one held pretty well until tiring in the stretch. Start this exotic off with a win bet here, too. (7) Funny Guy should have won last week at 2-1 and still seems too good for most of these. (1) Gutsy Winds Ahead showed promise last week, gaining late while picking up the show spot. There is not much else going on in this field. Three hot horses are here, two that won last week, but we like Franco Smoothie N, who took second at 9-1. He tanked the week before for us, where he was placed on the ticket because of a good performance going into that race. He could toss in a big mile at a decent price. The outsider is Alias Jones (2), who raced far better than 18-1 last week. The return winner, though, could be Power Of Elizabeth (3), coming off a strong mile.